Tennis bracelet with brilliant cut triple AAA quality cubic zirconia alternating with round created blue topaz prong set in a continuous row around the wrist. 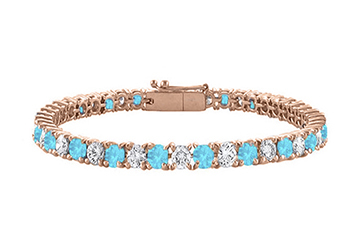 This created blue topaz and cubic zirconia tennis bracelet is entirely made from 925 sterling silver over 14k rose gold vermeil and is secured with a safety clasp. This 7 inch tennis bracelet total gem weights of seven carat.